You would think that growing a potted cactus is super simple. We mean like how hard can it be, right? Stick a cactus in some soil and all done. Well unfortunately that is not the case. 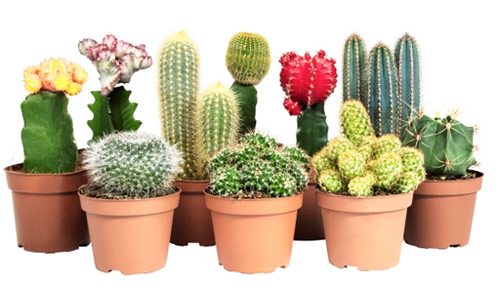 Even though potted cactus is rather easy to grow and virtually maintenance free, you still need to know a few things to make sure you have success. Several hours of sunlight each day and well draining soil are vital for a cactus to thrive. There are several varieties available to grow indoors potted which can add beauty to any windowsill with a lot of work. Select the planter. Shallow and wide is best since they have short roots. We like garden bowls and bulb pans. Make sure the pot has drain holes. Cactus don't like sitting in standing water. If your pot doesn't have a drain hole then they need to be drilled. 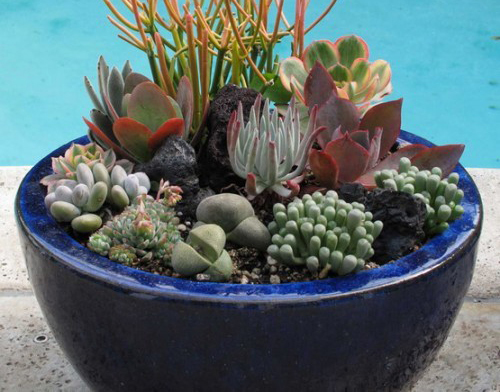 Purchase potting soil for cactus or succulents. They have gravel or sand in them to help with draining and nitrogen and phosphorus for indoor growing. The best varieties for indoor planted cactus are Prickly Pear, Rose Pincushion, Euphorbia dn Rebuita. Place the cactus in the pot semi filled with soil. Wrap it with paper towel or wear garden gloves. Once placed then fill the remainder of the pot with soil. Place a layer of gravel or sand on top and around the base of the cactus. Put the planter in a sunny warm location like a window where it can get 4 to 6 hours of sunlight daily. Water as needed around once a month. 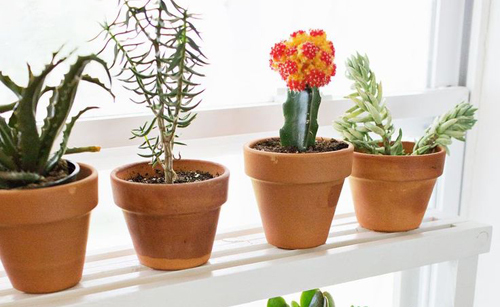 Fertilize once or twice a year using houseplant food for cactus. Not to difficult. Remember DO NOT OVER WATER. And, there you go! Read more.....How to repair a broken pot. Read more..... The right pot for succulents.